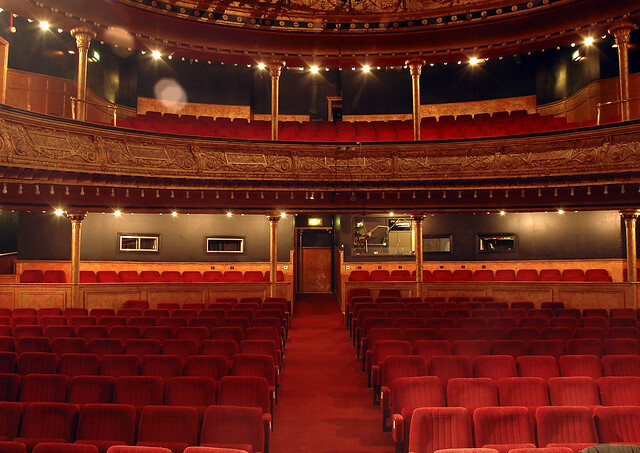 The Citizens Theatre has a rich and varied history with many fascinating stories to reveal. The Citizens Theatre has the most complete working Victorian theatre machinery in the UK and is the second oldest operational theatre in the UK, preceded only by Leeds Grand which opened 6 weeks earlier. The building, which is a Grade B listed building retains many of its Victorian architectural features; it is the only theatre in Scotland still to have its original machinery under the stage. The theatre also features an original Victorian paint frame and related fly system, which is still used today to paint backcloths. The remnants of an old bowling alley and a shooting range are closed up beneath the theatre. The building which is now known as the Citizens Theatre was built in 1876 and opened in 1878 as Her Majesty’s Theatre. It was one of four theatres in the area at that time – the now O2 Academy, the Coliseum (now demolished) and the Palace of Varieties (formerly adjacent to the Citizens Theatre). The theatre went bankrupt and closed very shortly after opening. The troubled theatre was the venue for a fabled riot, which ensued after an elephant panicked on-stage during a show. It was re-opened in 1880 by Harcourt Beryl under a new name, the Royal Princess’s Theatre. The Royal Princess’s Theatre was designed by Campbell Douglas, a friend and contemporary of Alexander Greek Thompson. The building shared an exterior with the adjacent Palace, which featured columns taken from the Union Bank in Ingram Street and several large statues which were the work of Glasgow sculptor John Mossman. His Majesty’s Theatre was operated by Director Manager, Rich Waldon until he died in 1922. The theatre was then inherited by Harry McKelvie, who had worked his way up from programme seller to manager. It was he who then leased the building to the Citizens Theatre Company in 1945, when it was renamed the Citizens Theatre. The Close Theatre Club was created in 1965 by the Citizens Company as a studio theatre in an adjoining dance hall, mainly to get around the laws of censorship, which forbade showing of certain plays deemed to be unsuitable for general public viewing. The bar remained open after normal drinking hours and it was known as one of the fees places you could get a drink on a Sunday. The Club was founded with the financial assistance of Michael Goldberg, who was at that time Chairman of the Citizens Theatre. By creating a club, the Citizens could circumvent the censor and present plays which otherwise would not have been seen. It housed a 150 seat auditorium and its aims were to present already established work in a new form and also to encourage the writing and presentation of new and experimental plays. The Close was successful up until the early 1970s, although by that time theatre clubs were becoming obsolete as a subversive means of expression, as censorship laws were repealed in 1968. The Close Theatre was destroyed by fire in 1973. In 1977 the Palace, which was located where the current Citizens car park is, was subject to an order for demolition, with very little notice given. The then General Manager of the Citizens, Clare Blenkinsop, arranged a stay of execution in order to rescue the best Victorian fittings that were still a part of the Palace’s decor. Citizens Theatre staff worked overnight and saved some of the original features of the building – statues of the four muses, William Shakespeare and Robert Burns from the exterior as well as the nautch girls and elephants from the interior. All of these statues and features can be seen now in the Citizens Theatre foyer. In addition the original box office, inlaid with jade, was saved and is on display in the People’s Palace, while a recreation of one of the Palace boxes was part of the collection at the Theatre Museum in London (now housed at the V&A, London). The modern atrium foyer of the Citizens Theatre was built in 1989 as part of the development of Gorbals Street by Strathclyde Regional Council. This was followed in 1992 with the construction of the Stalls and Circle Studio venues. In 1997 the Company received National Lottery Funding for building development work and this allowed for the addition of lifts - backstage and front of house, wheelchair access ramps around the building, a new stage door and a large scale rehearsal room. You can read an in-depth study on the history of the Citizens Theatre and its architecture in “A Conservation Management Plan” by TheatreSearch - Historic Theatre Consultants. Visit the BBC Arts page for more about the Citizens Theatre’s history including interviews with Pierce Brosnan, Roberta Taylor, Mark Rylance and Giles Havergal.